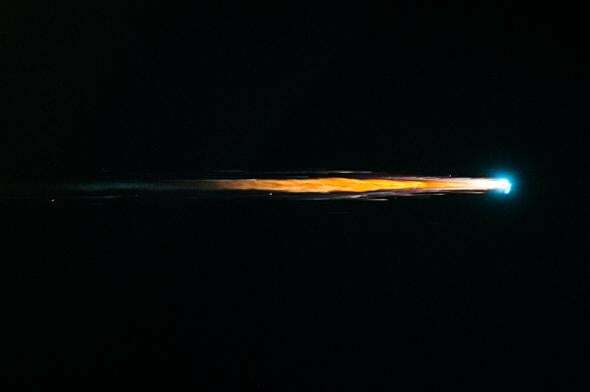 The ATV4 resupply ship Albert Einstein re-enters Earth’s atmosphere after a successful run to the space station on Nov. 2, 2013. The re-entry of WT1190F may look much like this. Before I even start: I know some people get very nervous about stories like this. Let me assure you, we’re safe. Read on, and don’t panic! For one of the very few times in history, humans have spotted a piece of cosmic debris on an impact course with Earth before it enters our atmosphere and burns up. The object, temporarily called WT1190F, will enter Earth’s atmosphere and burn up on Nov. 13 around 06:20 UTC (01:20 Eastern US time) near Sri Lanka. And it almost certainly will disintegrate harmlessly in our air; it’s too small and light to reach the ground. We’ve seen objects coming in from space that have hit us before—specifically the tiny asteroids 2008 TC3 and 2014 AA—but this time astronomers are pretty sure it’s not an asteroid at all but actually a rocket booster or fuel tank from a previous launch! WT1190F was discovered on Oct. 3, just a few weeks ago, by astronomer Rose Matheny in data taken by the Catalina Sky Survey. It’s very unusual. For one thing it’s very faint, and therefore quite small, and for another it’s in orbit around the Earth! Right away this makes it overwhelmingly unlikely to be an actual asteroid; an asteroid on an impact trajectory with Earth will almost always be coming from deep space. It orbits the Earth on an extremely elliptical path, which is also typical for used-up rocket motors. It orbits once every three weeks or so, getting as far away as about 650,000 km (more than 1.5 times as far as the Moon). Again, this is far more like a rocket booster than a natural asteroid. Given that orbit, it may very well be from a recent Moon mission. According to the European Space Agency’s Near-Earth Asteroid group, it was also seen in Catalina data from 2013, allowing a pretty good orbit determination (the longer you observe an object, the better you can figure out its orbit). Over time, the orbits of objects can change due to a number of factors, including (seriously) pressure from sunlight. By measuring this effect, astronomers have calculated that WT1190F has an incredibly low density, about 10 percent that of water. No known asteroid has a density this low, but it makes perfect sense if it’s a hollow object like a booster or fuel tank, probably just a couple of meters across. WT1190F (arrowed) observed on Oct. 9, 2015, using the University of Hawaii 2.2 meter telescope on Mauna Kea. Note the motion against the streaks of background stars. This is why we can be confident that it’ll burn up harmlessly. Its low density and small size means it’ll slow very rapidly once it contacts Earth’s atmosphere, creating a lot of heat that should break it up and vaporize it. I’ll be careful and say that some pieces may survive re-entry and hit the Earth’s surface, but they’re likely to be very small. Note that the impact is expected to occur about 100 km off the southern tip of Sri Lanka over the Indian Ocean (since the Earth’s surface is three-fourths water, most impacts occur over the ocean). That prediction may be off by 10–20 km or so (atmospheric drag makes pinpoint precision impossible with such objects re-entering), but still, it seems very likely that any pieces that manage to survive will fall into the water. It’ll be very faint right up until it burns up, far fainter than a human eye can see (if you’re an astronomer who wants to try your hand at observing it, the ephemerides are online by Bill Gray of Project Pluto; also note the ESA NEO Coordination Centre will be putting together an observing campaign, so head over there and take a look at their site). Once it enters Earth’s atmosphere though it’ll rapidly heat up, glow, and should put on quite a show for people in the area. I hope we get good photos and video! If you live in Sri Lanka and catch it, please contact me! If you are in that area, you’ll need clear skies above you and to the south to see it. When it happens, it’ll be moving faster than a satellite would across the sky, but slower than a typical meteor, and may actually look like it’s shedding sparks as bits and pieces of it melt off and blow away. To be clear, I’m not at all worried about this, and in fact I’m quite excited we may get a chance to see it! It’s very rare to find an object before it impacts, and in the previous two cases they were discovered only about a single day before they burned up. This time we have a few weeks, so hopefully there will be more observations of it. That’s important: An object under the influence of nongravitational forces (like sunlight pressure) can have a difficult orbit to predict, so the more observations of it we have, the better we’ll understand just how these forces work on small objects. This will also be a nice shakedown of the systems in place that alert us to any more dangerous incoming objects. Testing those out under safe circumstances like these strikes me as a pretty good idea, too.